Holiday in Egypt doesn't always mean Hurghada or Sharm El Sheik. 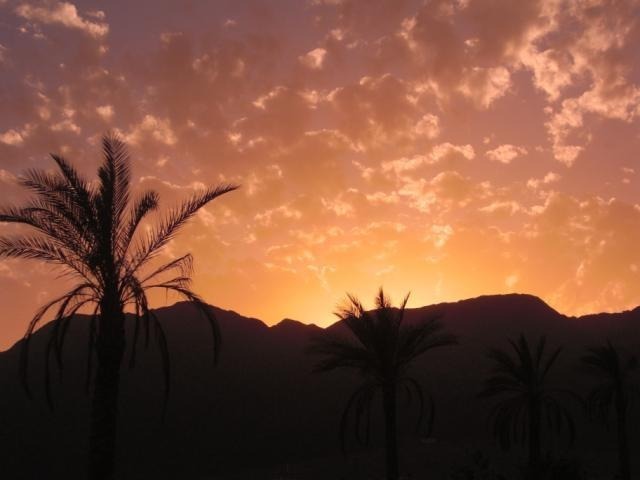 At the eastern part of Sinai Peninsula, on the coast of the Gulf of Aqaba, somewhere between Taba and Sharm el-Sheikh, there is less famous tourist resort called Nuweiba. 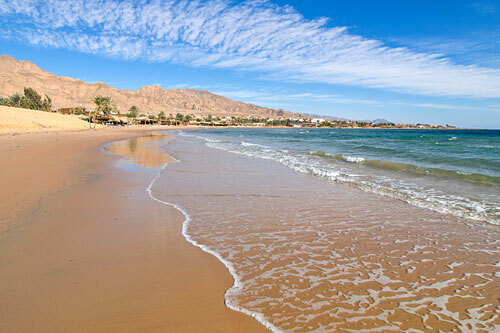 Nuweiba is short for Nuwayba'al Muzayyinah in Arabic which means waters of Moses open. It's suggested that this town marks the location of the Crossing of the Red Sea in Biblical times. It's ideal place for tourists looking for less formal resorts and for that matter, less crowded resorts. Noweiba lies either side of the Wadi Watir delta and can be divided into three main sections and runs for some ways along the beach. 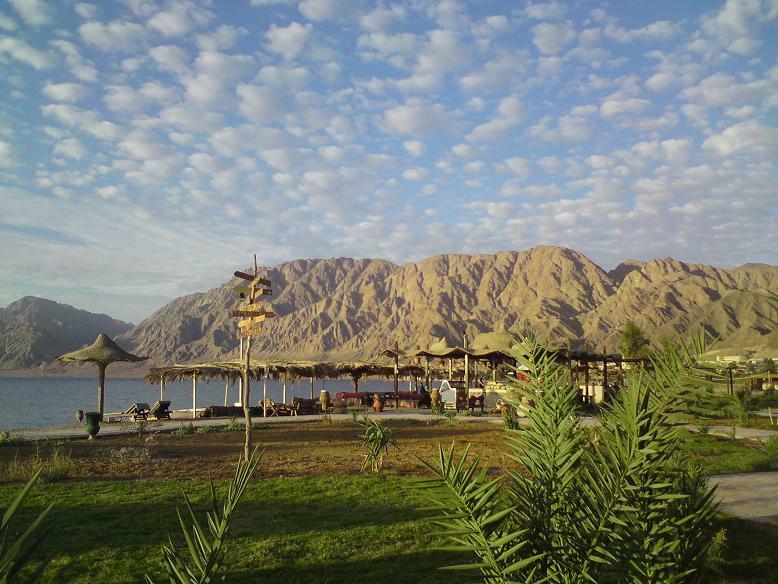 The three areas consist of the port of Noweiba,(known as Nuweiba Muzeina), Noweiba City which has a bazaar and tourist shops, and Tarabin which is the real party area of the area. This place is mostly inhabited by the Bedouin tribes and it is the beauty of this tribal culture that makes the place so attractive. There are two Bedouin villages in Noweiba: Muzeina Bedouin fishing village to the south and the Tarabiin Bedouin and tourist villages to the north. They are separated by an 18th century Turkish citadel. The well inside the ruins has served the Bedouins as a fresh water source for centuries.Tarabin village is well known for its lively oriental atmosphere and Bedouin-style camps where one can rent cheap huts. Along the beach lively outdoors restaurants furnished in Bedouin style with carpets and cushions invite to lay back and relax and let the time pass by. The most attractive tourist activity in the Noweiba region is scuba diving. The marine life in the adjoining water body is simply amazing. The sea coast all along the Sinai Peninsula region is brimming with marine life. There are some good snorkeling and diving sites and sheltered camp of Ras Shaitan has lovely beach huts offering peace and tranquility. The camp of Ras Shaitan, is named after a rock formation on the tip of the bay, which the Bedouins believe resembles the head of the Devil. The camp is sheltered by these outcrops of rocks, to offer a calm, and quiet area. There is a restaurant offering a mixture of Bedouin food and drinks, and western meals throughout the day, and a small shop where you can purchase Bedouin clothes and goods. Besides the diving, you will also find camel and jeep adventurers. The Colored Canyon is nearby, and a little beyond is the oasis of Ain el-Furtaga. Colored Canyon has become a popular safari trek and lies between St. Catherine's Monastery and the town of Nuweiba. The strange rock formations and colored canyon walls are dramatic and the silence within only adds to the oddity. Under ground springs throughout Sinai form a number of oases in surprising places. 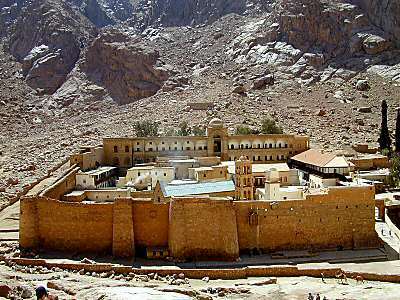 While here, don't miss to visit St Catherine's Monastery, the oldest monastery in the world with a unique history. Monastery is considered to being built on the site where Moses saw the burning bush. Between Mount St Catherine and Nuwebia there are few sites to visit. Wadi Ulrada - A valley of weathered rock formations, contrasted with soft white sand. Wadi Swall - Bedouin Village that offers overnight bedouin accommodation and is close to Nuwamis. Nuwamis is a mysterious pre-historic site with graves over 5550 years old (Copper Stone Age). It is believed that the Nawamis were ancient burial chambers. However, the identity of those been buried here is still a unclear. Close to Nuwebia is El - Haduda, the biggest sand dune in eastern Sinai. This is a great place to visit. Take a strong tray or strong smooth board and try sand boarding here, great fun. North of Nuwebia, at the very top of the Gulf of Aqaba, there is Pharoahs Island. This island has a long history. It features a medieval fortress similar to european castles of the same era. Surmounted by the imposing crenellated bulk of the restored citadel of Salah ad-Din, Pharaoh's Island is one of the most blatantly picturesque spots in the entire gulf. While the restored fortifications have firmly imposed a medieval character upon the island, the history of Geziret Faroun in actually one of exceptional complexity and interest. Be sure to take the road between Noweiba and Taba if you like beautiful scenery. Noweiba also has a daily ferry service to the Jordanian port of Aqaba (1 hour crossing time, two hours customs and docking times) and visit the amazing Petra with its monastery's carved from rock. This is a great excursion but it requires at least two nights in Jordan to be worthwhile. Nuweiba today is an insider tip for tourists and travelers who are looking for a unique holiday off the beaten path. It is a very personal experience, an adventure that lets you experience the art of hospitality and the encounter with friendly local people.